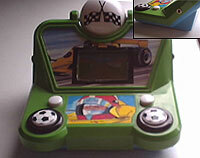 There are only a very small number of switch adapted hand-held games machines. On top of this, it seems unlikely that Nintendo's touch screen DS will be ever be made switch accessible due to the technical difficulties involved. This all said, many standard games consoles can be made portable with the addition of a small LCD screen and power adapter. Of note, there are quite a few one-thumb games available for mobile phones that may be of interest. The popular Apple iOS range of devices have a confusing array of switch interface which will work with a very limited range of games. Not ideal but giving hope for the future. 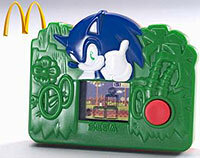 Adapted SEGA Toys that were originally available with McDonald's Happy Meals. Simple fun games. 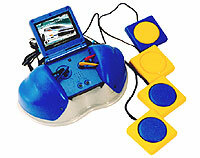 An adapter allowing up to four switches to use a Game Boy Advance. Not all games will be accessible and requires a suitable power adapter. Manual on-line here. Many cheap hand-held toys can be adapted for switch use. 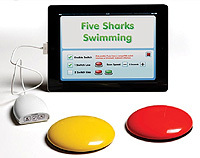 If you have one you would like adapted, get in touch with the above.